Also serving communities of Stephens City. There are 11 Assisted Living Facilities in the Winchester area, with 6 in Winchester and 5 nearby. The average cost of assisted living in Winchester is $4,270 per month. This is higher than the national median of $3,346. Cheaper nearby regions include Front Royal with an average starting cost of $3,613. To help you with your search, browse the 66 reviews below for assisted living facilities in Winchester. On average, consumers rate assisted living in Winchester 4.3 out of 5 stars. Better rated regions include Ashburn with an average rating of 5.0 out of 5 stars. Caring.com has helped thousands of families find high-quality senior care. To speak with one of our Family Advisors about assisted living options and costs in Winchester, call (855) 863-8283. Located in Northern Virginia in the Shenandoah Valley, Winchester is steeped in American history from the Revolutionary War through the Civil War. It was known as the first city south of the Potomac to install electricity city-wide and currently has ten major highways, ranging between regional and interstate, running through it. Seniors who live in this area and need help with daily tasks can choose from 17 assisted living facilities in the Winchester area, all of which are strictly regulated and licensed by the Virginia Department of Social Services. Weather in Winchester is known to have cool winters and hot, muggy summers. Average lows are freezing or below from November through March most years, while summer highs will peak in the upper 80s. The air quality in Winchester is below the national average with a score of 52, according to Sperlings Best Places. The U.S. average air quality score is 58, meaning it's not the most ideal air for seniors to breath on a regular basis, yet shouldn't lead to real health problems. It is surprisingly expensive to live in Winchester, Virginia, with cost of living averages topping both state and national medians. And it’s not just due to higher housing rates — a number of other daily necessities like groceries, health care and utilities are over both the state and national averages, making day-to-day life more expensive. Winchester’s crime rate is higher than the state average overall. It is only slightly higher when it comes to violent crime, but significantly higher when it comes to property crime. This makes it only safer than 18 percent of U.S. cities. The Shenandoah Area Agency on Aging (SAAA) has vans and buses that will provide rides for seniors over the age of 60 to and from the senior centers around the Shenandoah Valley, along with Winchester. These vans and buses also deliver meals on wheels at lunchtime. Another service provided by SAAA called WellTran also provides inexpensive transportation to seniors in the area. The Winchester area is home to world-class medical facilities, including Valley Health Winchester Medical Center, in the event of medical emergencies or illness. Assisted Living costs in Winchester start around $4,270 per month on average, while the nationwide average cost of assisted living is $4,000 per month, according to the latest figures from Genworth’s Cost of Care Survey. It’s important to note that assisted living rates in Winchester and the surrounding suburbs can vary widely based on factors such as location, the level of care needed, apartment size and the types of amenities offered at each community. 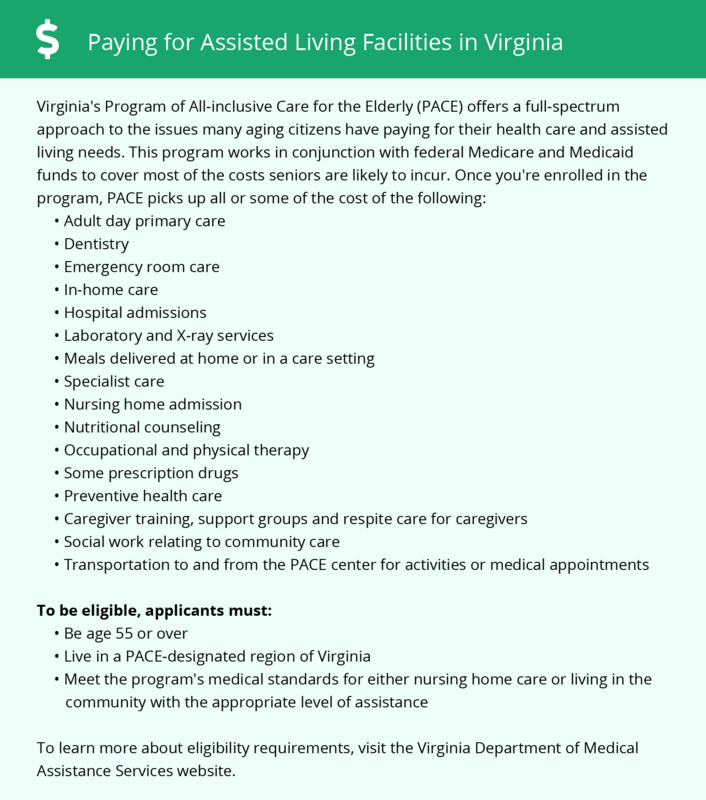 Seniors who need financial aide with assisted living can receive an income supplement through the Virginia Department of Social Services called an Auxiliary Grant, specifically available to those who receive Supplemental Social Income. This payment is issued to each qualified senior monthly and meant to help pay for the ALF. Learn more about these programs, plus who’s eligible, on our Assisted Living in Virginia page. For more information about different ways to finance assisted living, visit our Assisted Living in Virginia page. Winchester and the surrounding area are home to numerous government agencies and non-profit organizations offering help for seniors searching for or currently residing in an assisted living community. These organizations can also provide assistance in a number of other eldercare services such as geriatric care management, elder law advice, estate planning, finding home care and health and wellness programs. To see a list of free assisted living resources in Winchester, please visit our Assisted Living in Virginia page. Winchester-area assisted living communities must adhere to the comprehensive set of state laws and regulations that all assisted living communities in Virginia are required to follow. Visit our Assisted Living in Virginia page for more information about these laws.